A company growing at 50% available at EBITDA multiple of 12. As an investor, my experience is that I never lost on companies which are growing, good ROE when they are available at an EBITDA multiple close to 10. It looks like Apixaban has the potential to effect Alembic results. APIXABAN (gELIQUIS; innovator - BRISTOL MYERS SQUIBB [Pfizer is the partner in the US market] - Filed on September 30, 2015. Exclusivity Expiry - Dec 28, 2017 and Patent Expiry - Dec 22, 2019.
warfarin 505 b(2)filed in sept end. The tide is turning in a big way for Bristol-Myers Squibb, and CEO Giovanni Caforio let shareholders know about it during his presentation at the J.P. Morgan Healthcare Conference. 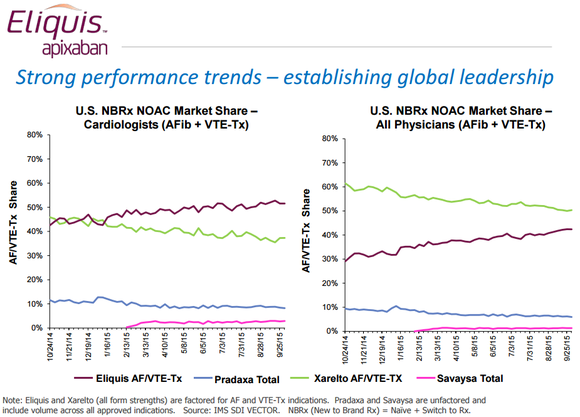 The data is pretty clear that Eliquis is on pace to become the world’s leading new oral anticoagulant. It’s racking up about half of all new-to-brand market share among cardiologists, which is as much as competitors Xarelto, Pradaxa, and Savaysa are doing combined, and in a year it’s closed from being about 30 percentage points behind Xarelto in U.S. new-to-brand market share for all physicians to roughly 10 percentage points behind. Why are physicians so keen on Eliquis? Aside from it having one of the top marketing budgets, which is really helping get the word out among consumer and physicians, Eliquis patients also exhibited fewer strokes, less major bleeding, fewer hemorrhagic strokes, and fewer deaths in trial in a double-blind, head-to-head study versus warfarin, a mainstay blood-thinner for more than a decade. Eliquis’ success will continue to be dependent on its label-expansion opportunities, but investors in Bristol-Myers and Pfizer would be wise to closely monitor the progress of this oral anticoagulant. Based on above excerpt, while Eliquis looks like it will affect Warfarin, it bodes well that scorching pace is set to continue which will allow gELIQUIS to be priced more competitively on exclusivity expiry. APL posted excellent results but the stock price is falling since. Is there something more than that has been read in the results ? Anyone here who closely tracks the company. Till now Tab.warfarin was the commonly used drug for long term antiocagulation. It has narrow safety window .Warfarin dose has to be monitored/adjusted regularly by measuring anticoagulant effect in terms of blood investigation called INR which hasto be mainatined between 2 to 3 in general. Warfarin posses the risk of bleeding which can be catastrophic sometimes to patients.other problem was dose adjustment and need for regular lab test to know INR .It is not easy for patient to go through regular lab test as they will be on warfarin around 6 months in general. With the newer anticoagulants like apixaban,rivoraxaban the problems looks solved. They don’t require regular lab investigation like INR. They found to be equally effective and less chances of bleeding compared to warfarin. This interference was based on various trials( EINSTEIN STUDY,RE-SONATE STUDY,AMPLIFY STUDY and AMPLIFY extension) Post these trials US FDA has approved apixaban for certain indication. Definitely use of these newer anticoagulants is going to increase in comparision to warfarin if they continue to be proved as equally effective with less side effects. gNexavar (SORAFENIB TOSYLATE innovator - BAYER HLTHCARE (codeveloped with Onyx Pharma, US filed on November 29, 2015) Exclusivity Expiry - Nov 22, 2020 & Nov 22, 2016 Patent Expiry - Jan 12, 2020. Sorafenib is a kinase inhibitor drug approved for the treatment of primary kidney cancer (advanced renal cell carcinoma), advanced primary liver cancer (hepatocellular carcinoma), and radioactive iodine resistant advanced thyroid carcinoma. Other DMF holders (six till Dec 31, 2015) including SICHUAN XIELI PHARMACEUTICAL CO LTD, Natco Pharma, ZHEJIANG JIUZHOU PHARMACEUTICAL CO LTD, RELIANCE LIFE SCIENCES PVT LTD, YABAO PHARMACEUTICAL GROUP CO LTD. The molecule had a worldwide sales of USD 800 million in 2014 (source: Bayer’s AR). Mylan seems to have the FTF for the molecule and the first litigation was filed against it in January, 2015.
gArcoxia (ETORICOXIB; innovator - Merck & Co). The drug is yet to be approved by USFDA while it has been approved in more than 80 countries including EU. Etoricoxib is indicated for the treatment of rheumatoid arthritis, psoriatic arthritis, osteoarthritis, ankylosing spondylitis, chronic low back pain, acute pain, and gout. Other DMF holders (just one) - Hetero Labs. The drug had a worldwide sales of USD 519 million in 2014. The success of the molecule will first of all depend on the USFDA approval for the innovator. gLatuda (Lurasodine Hydrochloride; innovator - Dainippon Sumitomo Pharma [marketed by Sunovian Pharms Inc. in US]. Exclusivity Expiry - June 28, 2016 & Patent Expiry - July 2, 2018. Lurasidone is an atypical antipsychotic. It is also approved for the treatment of depressive episodes associated with bipolar I disorder (bipolar depression) in adults. DMF filers - More than 15 including Sun, Lupin, Teva, Mylan, Torrent, Cadila, Aurobindo, Intas, Unichem and Piramal. Tentative approval - Lupin, MSN and Sun. It had sales of USD 752 million in North America during FY15. It seems to be highly competitive molecule with lot of filers and Alembic seems to be a late entrant. gNesina (ALOGLIPTIN BENZOATE; innovator - Takeda Pharma). Exclusivity Expiry - Jan 25, 2018 & Patent Expiry - June 19, 2016. Alogliptin is an orally administered anti-diabetic drug in the DPP-4 inhibitor class. Other DMF holders (three) including BEIJING HUIKANG BOYUAN CHEMICAL TECH CO LTD, MSN Laboratories Pvt Ltd, ALP PHARM BEIJING CO LTD. Total sales of USD 365.75 million worldwide during FY15. The drug seem to have not met the innovator’s expectations post genericisation of one of its blockbuster diabetes molecule, Actos (pre-generic sales of more than USD 5 billion). Strange are the ways of the market! Disclosure: I am holding shares in the company. I have recently joined the group and this is my first post. @chintans @drgrudge please think twice before posting on the thread. We as valuepickr members are expected to add value to the thread. This is not a general forum where you post your opinions at free will. @Satish_Invest please do your own homework before just copy pasting contents of an analyst report and asking others to do analysis for you. Every member however new, is expected to put in some effort and bring something to the table. Alembic has increased exports to US & intends to focus on it. Do the upcoming Presidential elections and news (may be unqualified) about restricting Pharma imports / overly protectionist policies sound warning bell ? Alembic has shown great performance but is there a framework to evaluate risk due to regulatory developments. The problem associated with Etoricoxib was increased risk of heart attack and stroke.Few points about it from US and EUROPE prospective. 1.US FDA refused approval of Etoricoxib in 2007 due to the above risk factors. US FDA advisory committee has voted 20:1 againt use of Etoricoxib. It has asked for more data regarding efficacy and safety of drug. 2. Following this MERCK has conducted two separate phase three trials evaluating safety and efficacy of Etoricoxib in rhematoid arthritis and ankylosing spondylitis from 2010 to 2014. Both studies have been completed and last updated on August and July 2015 respectively. 4. Recently( september 2015) abstract of study regarding its use in Rheumatoid arthritis has been presented at rhematology meet and no additional side effects were noted. 5. Outcome of above two studies may be important to get US FDA approval. We will wait for the complete study details and US FDA advisory committee recommendation on the same.If it gets approved the market size will be significant. (we have take the results of the above studies with pinch of salt as they are sponsored by pharma company). European medical agency(in 2008) has concluded that benefits of Etoricoxib the risks associated and approved its use in rhematoid arthritis and ankylosing spondylitis with some contraindication and warning. Its continue to be used in many European and other countries. I have been tracking the stock for the last 4-5 months and finally took an entry last month. The company has shown consistent growth since 2012 and the NPM have been increasing every year. Alembic Pharma`s generics exports business grew at 30% in FY11-15. With planned investments and 8-10 product launches every year in the US market, the company is expecting its US sales to grow at 56% CAGR in FY15-18. Given their higher spend in R&D and product pipeline, I am positive on the outlook for this company. However currently I have only invested half percent in Alembic Pharma and plan to invest more 500-525 whenever market gives an opportunity. I believe Indian Pharma is a great sector to be in for the next 5 years at least. Olmesartan medoxomil is an angiotensin II receptor antagonist which has been used for the treatment of high blood pressure. The innovator for the molecule is Daiichi Sankyo. The paediatric exclusivity for the product is getting expired on October 25, 2016. The product had sales of around USD 700 million during FY15 in US. Apart from Alembic, there are five other companies which have tentative approvals for the product including Teva, Mylan, Sandoz, Torrent and Jubilant. Second USFDA inspection in seven months (at Panelav formulation facility)!! Is this a new norm? Thankfully, just minor observations as per CNBC TV18 sources. "The USFDA inspection is completed for Alembic pharma at their Panelav facility which is based in Gujarat. They have received minor observations as per our sources and large part of them were infact already responded to to why, when the inspection itself got completed. Now in terms of Panelav facility, it is a generic formulation facility so it is one of the most important facility when it comes to the U.S. because it produce 100% of generics out of that and 35% of the total sales for the Alembic Pharma. So right now what we do pickup is USFDA inspection was completed last week and there were minor observations that have come through." This most recent inspection was triggered due to 505b(2) filing of Warfarin. In the lastest FDA inspection also according to scuttlebutt from local sources, Alembic has cleared the inspection. What kind of contribution Warfarin makes to Alembic needs to be seen but with back to back clearances, it seems alembic seems to be sitting pretty. 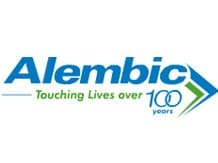 Is the news from reliable source - has alembic cleared the inspection properly? There was quite a price damage today? Am nervous as it is biggest holding right now bought at 50 odd levels 3.5 yrs back. Vadodara-based Alembic Pharmaceuticals, which has seen the share of exports in its turnover increase three-fold in the last five years, is likely to receive some minor observations (as a Form 483) from the US drug regulator for its Panelav facility. This facility makes formulations. US accounts for nearly 80-85 per cent of Alembic’s international formulations business. The US Food and Drug Administration (USFDA) had conducted an inspection of the plant last week, and senior officials of the company felt that the inspection was more or less good, and there would not be any major observations. A senior official of the company confirmed that Alembic is likely to receive a Form 483 from the USFDA and there is unlikely to be any major observations. A Form 483 is issued to a company after an inspection is completed and investigators have observed any condition which (in their judgement) may constitute violations of the Food, Drug and Cosmetic (FD&C) Act and related acts. The official claimed that Alembic is yet to receive any formal communication from the USFDA and as such expects the 483 not to impact business in the short or medium term. “It should not affect our product launches or our exports as such. We are waiting for the letter, and would respond with details of the corrective actions we plan to take at the earliest,” he said. Panelav makes formulations for the regulated markets and has a capacity to manufacture seven billion tablets and capsules per year. The formulations business accounts for nearly 86 per cent of its revenues. The share of international business is around 50 per cent in its turnover. Alembic’s turnover in 2014-15 was Rs 2,056.12 crore, which grew to Rs 2,513.82 crore in the first nine months of this fiscal. The company has till date made 75 drug filings in the US, of which 45 abbreviated new drug approvals (ANDAs) have received approvals or tentative approvals. Around 30 are under approval. The company expects to launch at least seven to ten products in the US every year from 2016 onwards. It launched six drugs in the US so far this year. It includes the blockbuster anti-psychotic drug Aripiprazole (Abilify), apart from Celecoxib (Celebrex), Valsartan Amlodipine (Exforge), Aripiprazole ODT (Ablify Discmelt), Memantine and Hydrochloride Tab (Nameda ). Alembic has invested close to Rs 200 crore to expand its facilities this fiscal, and plans to invest another Rs 350-400 crore over the next one and a half years. It has already commissioned its Sikkim plant this year, and is expanding the Panelav and Karkhadi plants near Vadodara, which also includes setting up of an injectables plant. Normally form 483 observations will be given by the inspectors on the last day of audit.Alembic must be having it if audit is completed.